Black Manta and N.E.M.O unleash the Shaggy Man, who wreaks havoc through Atlantis on his way to Mainland America. There Aquaman draws the line at Amnesty Bay and fights the Shaggy Man, until he is beaten within an inch of his life. Aquaman manages use his Justice League membership card to teleport the Shaggy Man into space. Mera learns about the battle and makes her way to the surface world. Mera finds Aquaman in hospital, they have a moment. Just then the Justice League walk in to make sure that Aquaman is OK after the battle. Superman and Aquaman talk, and shake hands. Later Superman being interviewed by a news station, reminds the people the world that Aquaman has the full support of the Justice League and that he has proven to be a true hero. Elsewhere Black Manta discusses with second in charge that the Shaggy Man plan may have failed, but they must move onto the next. A false flag operation. Aquaman makes his way back to Atlantis. And soon after they discover that the surface world has been attacked by... Atlantis? Story - 4: I have been enjoying this book since its Rebirth special. It has heavy political undertones, which should be expected, as Aquaman IS A KING of a sovereign nation after all. Superman has made two appearance in this book so far, and both times he has been handled quite well. I really liked the way Dan Abnett used Superman. He showed Superman's trust in his friends and teammates, and showed his diplomatic side. All in all, I am always happy when a writer uses Superman without making him a joke or a weakling. If you are not reading Aquaman, I urge you to check it out at the least. It's a good title, and a good balance of politics, action and super heroics. Art - 4: Phillippe Briones is a good artist. I like his story telling techniques. His style reminds me of Paul Pelletier and a little of John Romita Jr. I like the way he renders the Justice League. They seem like their classic counterparts from the bronze age, with modern twists. 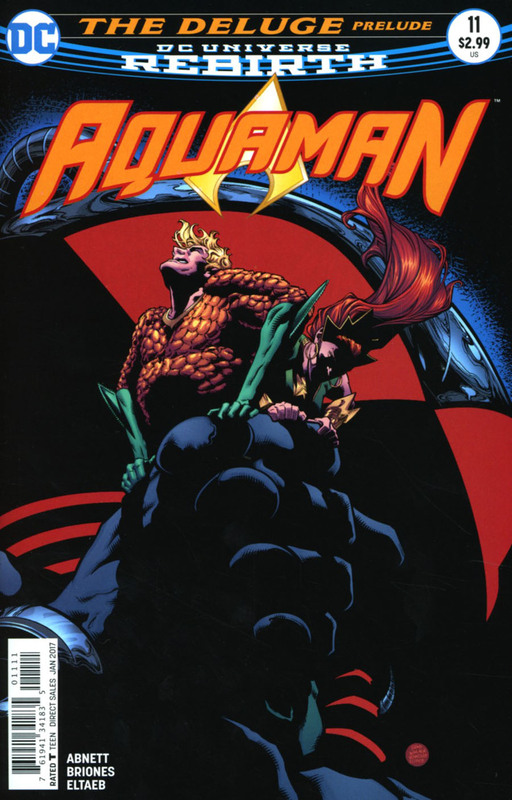 Cover Art - 4: I like the composition, perfect representation of Black Manta causing Aquaman and Mera distress.